Dec 2nd. Keith Kendrick and Sylvia Needham. Keith Kendrick and Sylvia Needham are making their third visit to the club as a duo. 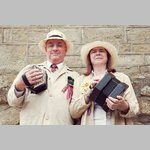 Both play concertina and are fine singers, both as soloists and singing harmony. Songs of the land and songs of the sea with plenty of opportunity to join in and, this being December, I am hoping for a few seasonal songs. They are equally at home performing at a festival or in the cozy confines of a folk club. In fact they run the Derby folk club which meets monthly in the old gaol house.